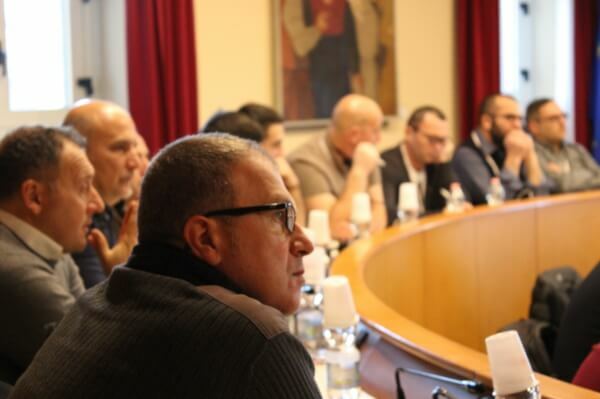 The European Transport Workers Federation (ETF) is gathering trade unions in Rome to set out their vision for the future of dock work in the era of automatisation. Following a first successful event in Antwerp in June last year, this two-day seminar, organised by FILT CGIL, FIT CISL, and the ETF, will explore the potential impact of new technologies on European ports. Workers, unionists and experts will discuss the most appropriate way for dockers and their trade unions to respond to changes affecting their industry and shape the future of their professions. European ports are operating in a highly unbalanced context. While ships grow ever larger, ports and terminals are facing constant demands to upgrade their infrastructure and superstructure and to automate their operations. At the same time, the consolidation of shipping alliances is reducing even further port operators’ negotiating power with their customers. This all has negative implications for dockers’ jobs and working conditions. There is potential to use automated technologies, ranging from remote-operated cranes to supply chain algorithms – but these are hugely expensive and do not always lead to increased productivity. And some European ports are growing strongly without major automatisation. Resourceful staffing pool systems, offering effective and flexible use of skilled human labour, offer gains in volume and productivity. The way ahead is uncertain, and this series of seminars aims to engage workers themselves in the conversation. Ports are important employers in regional economies, and they enjoy direct and indirect financial support from governments. Likewise, some shipping companies also benefit from favourable tax regimes, and it is their demands which are driving the automatisation trend. For the ETF, one thing is clear. Workers must have a voice in any process aiming to implement new technologies. Whether at company, sectoral or national level, unions must be consulted in good time on the use of new technologies which can replace or radically change jobs. Through collective bargaining it is possible to offer workers a share of the benefits – for example, in the form of shorter working hours. Moreover, unions have a role to play in setting up the transition funds and training programmes to support dockers through technological change. Unions are ready to negotiate constructively, and recent developments in several countries show that ETF affiliates can make a useful contribution to debates around automatisation. The ETF and its affiliates are not fundamentally against the use of new technologies, but we need broad dialogue between all affected parties: trade unions, port employers, shipping companies and governments at regional, national and European level. Ports are, by nature, an international sector. The decision to automate one terminal affects other ports, well beyond national boundaries. This means we need a European approach to automatisation which takes account of the complex effects on employment. Automatisation will certainly be a key topic for all transport workers in the years ahead. With seminars like this, the ETF and its national affiliates are engaging workers in the debate and building a movement to carry their voice to employers and policymakers. Such actions are a core part of the ETF’s #FairTransport campaign, running from now until the EU elections: the transport sector can and should provide millions of quality jobs, and policies should support decent employment in transport instead of social dumping. New technologies are full of potential, but society must make active and strategic choices to ensure that they benefit everyone and contribute to quality work. Visit www.etf-europe.org or follow us on Twitter at @ETF_Europe.